The most important part of your body is your head and you want to make sure that your head is protected at all times with a high quality cricket batting helmet. A cricket helmet is an essential piece of gear and players should not be going out to bat without a high quality and approved safe cricket helmet. What are Cricket Helmets Made of? Well most helmets are made of Polyurethane that has been hardened and set. Most helmets will then have a cloth finishing over the PU. The face guard of the helmet will either be made of titanium or steel. There are straps on the helmet too. What does conforming to standards mean? The BSI Group based in England is a global certification company that tests the quality of safety products and gear across a whole host of industries. Among those industries that they test the products in is the cricket gear market. 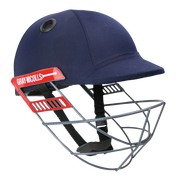 Recently one of the most prominent things they were looking for in a compliant cricket helmet is the fact that the ball should not be able to go between the grille of the helmet and the peak. What brands of cricket helmets are out there? Where to buy Cricket Helmets Online? Of all the cricket gear and cricket equipment that you are going to buy, it is most important that you buy a cricket helmet from a reputable source. For obvious reasons we suggest you choose Cricket Store Online. 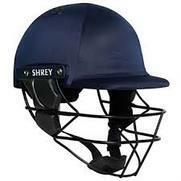 Our wide variety of conforming cricket helmets will ensure that your head safety is a priority. Our experts are also able to give you the best size advice to ensure that you get a well fitted cricket helmet. A well fitted cricket helmet is essential to safety. What about neck guards or Stem Guards? Shrey Cricket Helmets make a neck guard that is compatible with some of the models of the cricket helmets that they make. Masuri also make the equivalent of a neck guard that they call a Stem Guard. This Stem Guard is compatible with the Vision series Masuri cricket helmets. What else should I know about buying cricket helmets? It is important to know that if your helmet drops or falls or takes a blow from the ball, it should not be used until the structural integrity of the helmet has been checked by an expert. Quite often it can happen that the helmet will be compromised and there will be a need to replace the helmet all together. It is always worthwhile to remember that when you are buying a cricket helmet, you are considering the safety of your head.